New for Version 11: new content for 3D printing and Version 11 graphics capabilities, including word clouds; customizing/labeling; and new content for working with data, audio, linguistic data and dates; and an all-new index. Japanese and Chinese language editions are also available. 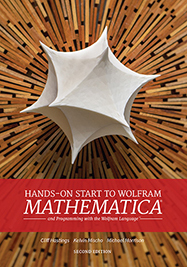 For more than 25 years, Mathematica has been the principal computation environment for millions of innovators, educators, students and others around the world. This book is an introduction to Mathematica. The goal is to provide a hands-on experience introducing the breadth of Mathematica, with a focus on ease of use. Readers get detailed instruction with examples for interactive learning and end-of-chapter exercises. Each chapter also contains authors' tips from their combined 50+ years of Mathematica use.